Ultrasonic testing of standard straight 7/8" steam generator tubes can be carried out with a number of systems. The Nerason UT system is especially developed to measure straight tubes with an ID of 10-100 mm, but is also capable of testing bended tubes. The current UT probe for small radius U-bends has limitations of a minimum bend radius of 55 mm and a tube ID of 20 mm. Also two different probes have to be used to cover the complete 360 degree of the circumference of the tube. On customer request Nuson has developed a new probe which does not have the coverage limitation and is capable of examining tubes with an ID of 15 mm. This presentation will show an overview of the probe design, the test results and the current developments that are carried out to improve the sizing capabilities. Why UT in Small Radius U-bends? Small radius U-bends of Steam Generator tubes are susceptible to IDSCC, especially when made of Inconel 600 tube material. Most PWR power plants inspect the small radius U-bends periodically with Eddy Current techniques (e.g. plus point probe, X-Probe). The Eddy Current techniques applied in the small radius U-bends are showing limitations in the detection of shallow defects (< 30% TW) and due to high signal noise deeper defects could be missed or misinterpreted. Missed defects could lead to unacceptable leakage rates, tube failures and costly shutdowns (see ref.1, Indian Point-2). 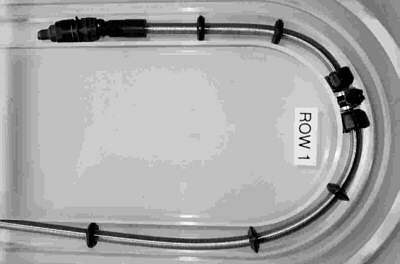 The typical set-up of the Nerason UT system for inspection of Steam Generator tubes is shown in figure 1. The Nerason Pusher Puller can be adapted to any kind of manipulator in the Steam Generator and will be remotely controlled from outside containment to move the probe in the desired tube and to perform the measurement. A so-called LCU (Local Control Unit) is taking care of the local electronics and water supply system. Figure 2 shows the probe design. The UT module is based on the "surface riding" principle. The transducer is spring loaded in a housing, riding on the ID surface to compensate for tube ovality and to maintain the optimum angle of incidence for the sound beam on the ID surface for the entire tube circumference. The housing of the UT unit is made of a wear-proof plastic with a low friction coefficient. At both sides of the UT unit centrings are mounted for good axial positioning in the U-bend. By means of a flexible spring the UT unit is connected to the motor unit and will be rotated. The motor unit does not enter the U-bend section. Fig 2: U-bend surface riding probe. Prototype probes for circumferential and axial crack detection have been tested under lab conditions using several row-1 U-bend samples. The samples examined contain the following defects: circumferential notches 20% and 40% TW, axial notches 20% and 40% TW, circumferential IDSCC 90% TW. Figure 3 shows an analysis plot of a measurement with the Nerason UT system. At the top general information can be found, such as tube number, inspection speed, date, operator, etc. Fig 3: Measurement plot of circumferential notches. Fig 4: Measurement plot of axial notches. Fig 5: Measurement plot of circumferential IDSCC. Seven different plots can be seen. The third plot from the right is showing a C-scan presentation of the Time of Flight of the defects. The vertical axis is showing the position of the probe in the tube, while the horizontal axis is showing the circumferential position of the defect in the tube. The artificial notches are showing up very clearly. The first plot from the right is showing the B-scan presentation at the position of four 20% notches. The vertical axis is the complete tube circumference. On the horizontal axis the time of flight of the defect is indicated. Figure 5 shows the measurement result of the tube with the circumferential IDSCC. The depth sizing is still based on the echo-dynamic technique and will be more accurate for shallow defects. It will be very difficult to see the difference between a 80% and 100% TW crack. The new UT probe is showing good results on detection of small notches and large artificial IDSCC defects. More accurate tip sizing will be possible with the new 12-bit version of the Nerason system (ref. 2), using tip echo diffraction techniques. It is to be expected that the probe will be capable of detection of 10% TW IDSCC. For complete qualification of the probe, test samples with shallow IDSCC should be examined. These samples are currently being made by ENSA (Spain). A field test will be carried out soon at Maanshan NPP (Taiwan).